Plants oblanceolate to obpyramidal in the upper portion. Culms 80-150 cm; internodes not glaucous. Sheaths usually scabrous; ligules ciliate, cilia 0.2-0.5 mm; blades green, smooth or pubescent. Subtending sheaths of inflorescence units (2.3)2.9-4.5(6.3) cm long, (1.5)2.3-3.3(4.4) mm wide; peduncles (2)5-10(16) mm; rames (1.7)1.9-2.3(2.8) cm, exerted. Keels of lower glumes usually scabrous below and above the midpoint. Andropogon glomeratus var. scabriglumis grows in moist soils of seepage slopes and the edges of springs, from California to New Mexico and southward into Mexico. 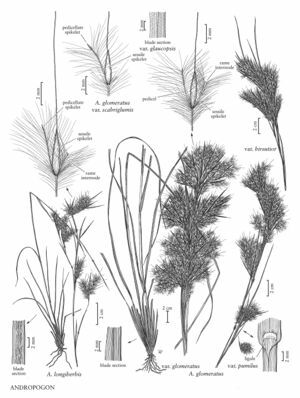 Facts about "Andropogon glomeratus var. scabriglumis"